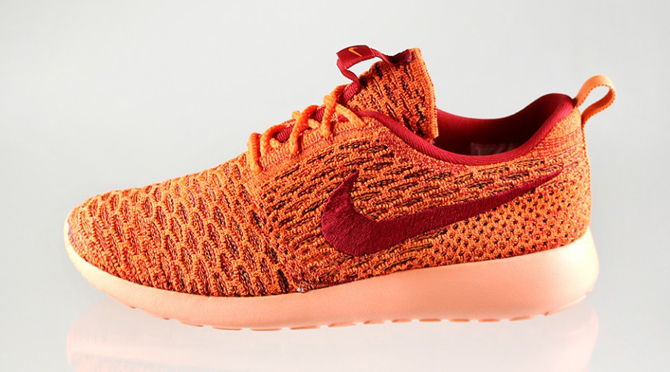 Female sneakerheads have another exclusive coming their way thanks to this new Nike Flyknit Roshe Run release. The shoe features a tonal look across the upper that switches between total orange and gym red, along with a "sunset glow" shade on the sole that's not far off from the upper's colors. This Nike Flyknit Roshe Run is one of those that ditches the NM sole so often used on newfangled Roshe releases. This Nike Flyknit Roshe Run will be arriving at European stockists in June, meaning they should land in the U.S. a couple weeks after.